This is the first official episode of “Judex,” the first having been mere “prologue.” This one would make very little sense without it the other, however, so I’d be inclined to call it episode 2. The story picks up shortly after the engagement party at which the banker Favraux (Louis Leubas) unexpectedly died after taking a sip of wine. 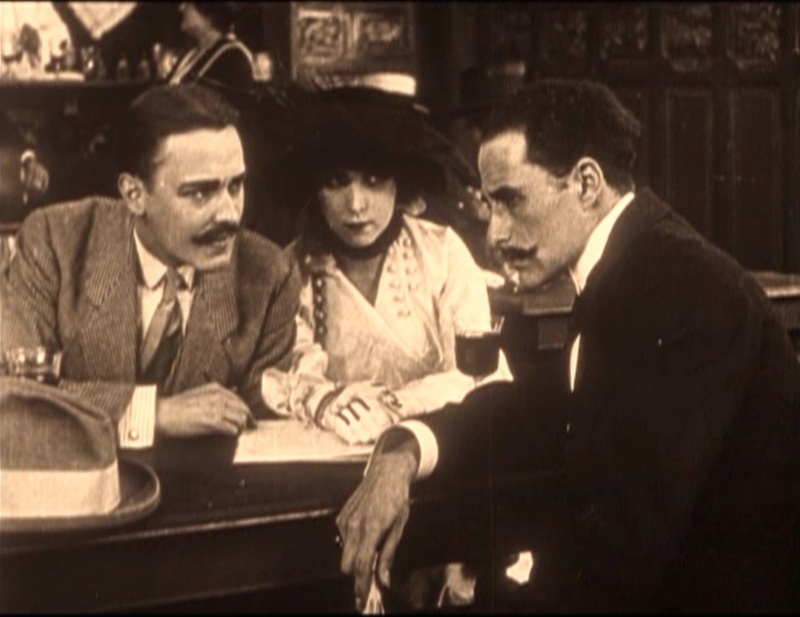 His daughter Jacqueline (Yvette Andréyor), who is completely innocent and ignorant of the crimes he has committed, is grief-stricken, but now Cocantin (Marcel Lévesque), the detective Favraux hired, shows her the threatening notes that he had received, which explicitly accuse him of theft and murder. She checks with her father’s secretary and learns that it is all true. Then, to add to her stress, a new note arrives that explicitly enumerates the crimes the mysterious “Judex” holds Favraux responsible for. She decides that she cannot keep a fortune earned dishonestly, and makes arrangements to give it all to the Bureau of Public Assistance. Since the Viscount (Georges Flateau) had only wanted to marry her for her money, she releases him from their engagement. 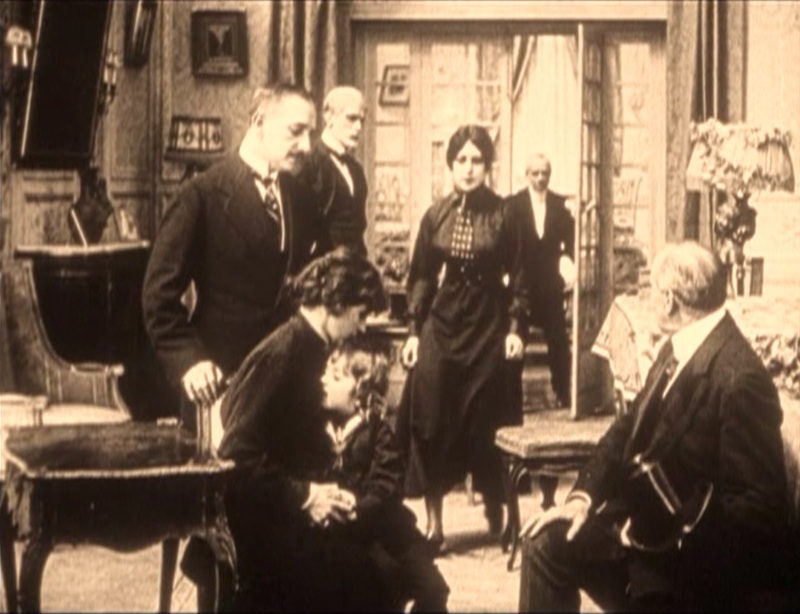 She puts her son, Little Jean (Olinda Mano) in the care of trustworthy servants, dismissing the others (including Musidora), and seeking work to support herself and to send money for his education. Before she can leave the now-empty mansion, however, she receives an unexpected phone call. The voice on the other end sounds like her father, and he begs for her forgiveness. Jacqueline thinks she must be going mad, and goes out into the street alone, but we shift scenes to the recent past and an explanation. 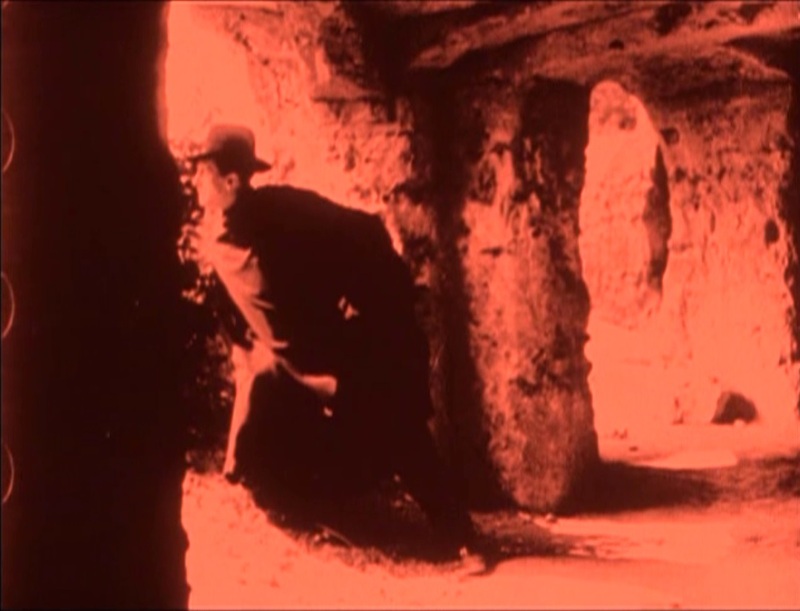 For now we first see the shadowy Judex (René Cresté) with a gang of grave robbers, retrieving the body of the deceased and taking it to an underground catacomb. 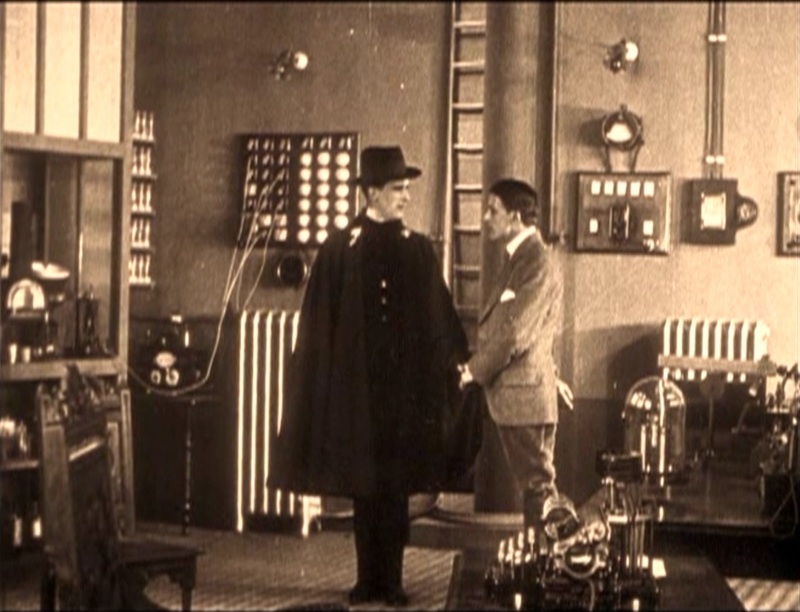 Jude is tall and slender, and wears a hat and a long cape, looking somewhat like the Shadow, although his face is visible. His base is “the underground passages of Chateau Rouge.” He revives the “dead” man, revealing that the poison in the drink only gave the appearance of death, and forces the man to call his daughter and beg forgiveness. Next, we see Little Jean, apparently enjoying helping out with chores on the farm he now lives on with the former servants, and receiving a letter in which his mother tells him about the work she has taken on, tutoring English and music. He tucks the letter lovingly into his blouse. Then, we see Jacqueline at her work, still wearing the black clothing of grief, and fending off the advances of an overly amorous employer. Said employer, it transpires, is buddies with Moralés (Jean Devalde) and Musidora, and he tells them of his infatuation. They advise him to let them abduct the woman of his dreams, possibly because they connect her with the disappearing heiress, whose whereabouts the papers are speculating about, or maybe just because they are criminal types who think that way. As they present the plan, they can capture her and then allow him to rescue her. Judex, however, is watching over Jacqueline, and sends her two white doves, which he instructs her to release if she ever needs his assistance. This episode isn’t really a complete story, nor is it a “cliffhanger” the way serial episodes would be in years to come. It still seems to be taking its time in setting up situations without actually developing them very much. We now know that Jacqueline’s father is still alive, and in the custody of Judex, but it isn’t clear what justice Judex plans to enact on him. We know about the kidnapping plot, but haven’t seen it put into action. Also, we know that Jacqueline is effectively in hiding, but it’s not really clear what the bad guys want with her since she no longer has a fortune. We do get our first look at the title character and his home base, which is really just a room with various technical gadgets and a sliding panel, but it does fire the imagination that he has this underground chamber with apparently more secret rooms attached. 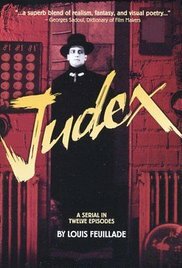 In the background lurks Judex’s brother, played by Édouard Mathé, the bland star of “Les Vampires.” He seems more suited to his sidekick role, here. Sadly, we haven’t seen any more of Lévesque, who was really the saving grace of “Les Vampires.” I hope we aren’t done with him. The photography in this episode is a bit less mobile than in the prologue, and we spend less time in close-up, and there are longer waits between edits, making this one seem a bit slower than the previous one although it is ten minutes shorter. There is, however, some nice tinting on the night scenes. The scene of the retrieval of the banker’s body is tinted red, I assume to give the impression of torchlight, or perhaps to heighten the mood a bit, and Jacqueline’s race into the unknown is tinted blue. This adds some visual interest to the story, but we’re still just getting started.